Busking combines practice with performance, while earning money. I often busk at local community markets, playing mostly fiddle tunes on harmonica. An ideal street musician combination is a duo, with guitar, harmonica and shared vocals. If you are already busking, or thinking about it, then the following will be helpful. 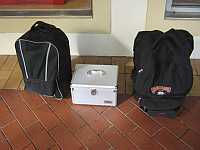 For solo instrumentalists (harmonica in my case), accompaniment is useful. I use Band in a Box to produce backings for my fiddle tunes. These are loaded on to an iPod, which runs through my PA. Band in a Box also produces decent jazz backing tracks. I have also seen many jazz players busking with the excellent Jamie Aebersold backings. 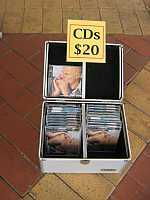 A variety of good blues backing CDs are available. 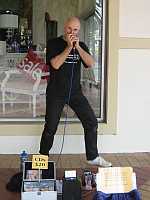 Also some free blues harmonica backing tracks are at my Harmonica Academy teaching site. Using backings implies a PA. I recommend this, as unamplified busking will have you thrashing your instruments just to be heard. However there is no need to be loud. You should aim to be heard within about a 10 metre radius only. Any louder will discourage nearby listeners (the ones likely to leave coins), and will risk complaints from local shopkeepers. A battery powered system is best, as power is almost never available. Something like the Fender “Amp Can” should provide adequate volume and battery life, and will fit into a backpack (along with the rest of your gear). 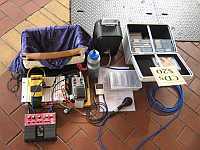 I’ve made my own PA, shown in the photo) using a sealed lead acid battery, car stereo amplifier and speaker box, delay pedal, battery powered mixer and EQ. 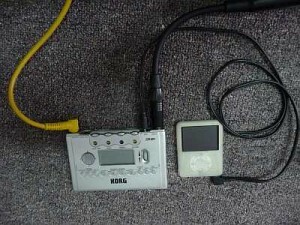 An iPod runs the backing tracks, which feed into the PA. 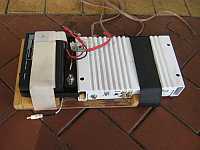 The “power” amp is a car stereo, working in bridged mode. This means that both channels are combined, giving more power. If you buy one of these amps for busking, make sure that it works in bridged mode, otherwise you will only be using half of the amp. Mine provides about 70 watts, which is plenty. 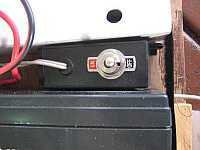 The amp runs from a 12V selaed Lead Acid battery, which sits next to it, as shown in the picture. The battery goes for about 4 hours, I carry a spare. I use a small number of effects, as shown here. The delay pedal is the most important. It fattens up the sound a lot, while still keeping it clean and easily heard. The graphic equaliser is very useful if you use backing tracks. In particular, I use it to reduce specific bass frequencies, which means that my system will go much louder while remaining clean. The pink loop station acts mostly as a two channel mixer (harmonica and backing tracks). However I play harmonies on some of my tunes, and use the loop function for that. My backing tracks are on an iPod, which feeds into one of the mixer inputs. My effects run off 9V DC. I could use batteries… but would then have to buy and carry replacements. Instead I use a 9V regulator, which inputs the 12V from the main battery and produces 9V to power the effect pedals, as shown here. I built it myself. No rocket science needed for this (although I do have an electonics degree). 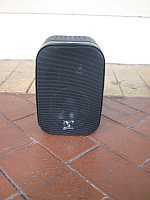 In recent years an excellent range of small weatherproof high power speakers have become available. These are often used for piped music in outdoor spaces. They are small, easily carried, loud, clear and excellent. You can see mine here, and in the picture below. The whole setup looks like this. Busking usually involves playing outside. You will find that wind removes moisture from your lips, and that your mouth becomes dry. For instruments like harmonica, a dry mouth and lips means no music. 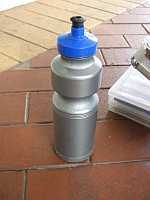 You must carry a water bottle, don’t attempt to busk without it. If you forget to bring one, then get bottled water from the nearest store). Busking often ends up as paid practice, and can greatly sharpen your skills. 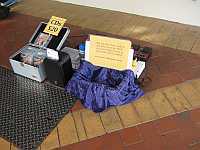 Also, if you have CDs, then busking can pay quite well. Take a small stand, make up some decent signs (think of it as a miniature trade show), and you may be surprised at the business you get. What does it sound like when you busk?